Back-Up Story: "The Origin of General Zod"
Karate Kid visits Brother Eye with Buddy Blank. Brother Eye indicates that the Great Disaster has come to him. Piper and Trickster try to escape the wedding of Black Canary and Green Arrow (somehow now in a cave). Trickster makes oblong comments about gay people for humor, and then they find a television with Joker on it talking. Jimmy Olsen, meanwhile, again tests his powers at Cadmus labs. He fries the equipment and slinks away. Todd and Jokester talk for two pages. Todd punches Jokester. The Earth-15 Batman, Wonder Woman, Atom, and Green Lantern show up. On this Earth, the sidekicks have become the main heroes. Batman is Jason Todd, and Donna Troy is Wonder Woman. Piper and Trickster toss the television into Ivy for revenge, and it blows up, sending her flying. They steal a porche and drive away, only to find a member of the Royal Flush Gang taking them hostage. For seven pages, the heroes banter about the differences between their Earth, culminating in the Zod Superman showing up. They bid the heroes farewell, and they leave. Another monitor comes after them. Holly Robinson and Harley are tested outside of Paradise island by being thrown into a shark-filled ocean. Generally a recounting of the post-New Earth Zod. Main Story - 1: At least it's consistent in how bad it is. That's about all it has going for it. I have no idea how Brother Eye went from destroyed to essentially HAL and in its older incarnation. I wish a small box could have cued me in. 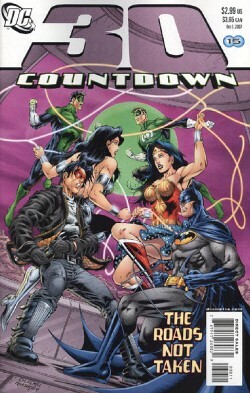 And hey, I even READ "JLA: Wedding Special", but I don't recall a culminating scene in a cave. I remember a big fight at the wedding, but none of what Piper and Trickster are doing. And beyond that, I see no character motivation for Piper and Trickster to be there, even with the "I wanted to check that they listened" schlock. One of my three best friends is a gay dude. I poke fun at him for being gay, he pokes fun at me for being straight. It's always out of love for each other, it's respectful, it's fun. I understand that's what they were trying to go for with Piper and Trickster. Instead, it sounded like out of place, arbitrary homophobia that's trying too hard. In other words, I have a sense of humor for gay jokes (just as I have a sense of humor for breeder cuts), but this failed miserably. Hey, let's have ANOTHER scene where Jimmy tests his powers. Haven't had enough of those. Or maybe a scene where Piper and Trickster are taken hostage in an impossible situation. Or maybe just seven pages where we have character stagnation to examine the cool factor of Earth-15, which is actually a worthless, stupid Earth, given that it intimates Jason Todd would or could ever be Batman and have the city be a better place. Not even Geoff Johns could write that plausible, buckos. Jokester joining the group, yawn, Jason Todd and Jokester talking two pages before Todd punches him... predictable... yawn. I sat back and wondered to myself, what is Piper and Trickster's motivation. What is it? I have no idea. Why are we watching them? 21 issues in, it's sad that I have no clue. For that matter, why are we watching Holly? The only subplot that seems relevant or even remotely coherent is the Todd/Troy combo, but even that seems like walking guest shots and cool factor for the sake of cool factor. God, I hate Countdown right now, and it doesn't seem to be looking up. Don't waste your cash. Main Art - 4: The art is decent and consistent along most lines, with a few awkward looking characters in the fight scenes, and several very good action poses along the way. The consistency of the characters in this series works well, as does their vivid portrayal. If only the story could catch up, like, at all. Back-up Story - 5: Covers the material well, written very strongly, and showing much of what we know about the new Zod. I do regret no lip service or mention of the other Zods, but it isn't necessary for this to do its job, and do it well. Back-up Art - 5: Great stuff, particularly the last panel, which is just a great moment. Cover Art - 4: Decent pose, decent dilemma, it actually happened in the issue, and the scene is interesting. The only issue I have is that I have no idea what the hell is going on in the background, why there's a huge green spotlight, or why anyone still thinks words on a cover is interesting at all.